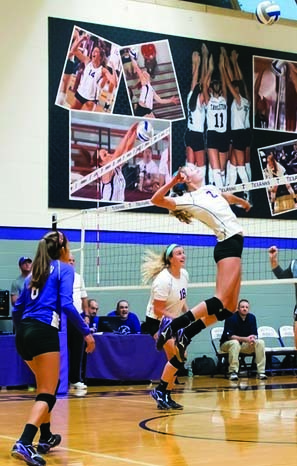 After a historic 24-8 season in 2014 for the TexAnns, head coach Mary Shindler and the rest of the volleyball team are ready to carry the momentum into this season. In the Lone Star Conference preseason polls, the TexAnns were picked to finish second. The TexAnns dominated Howard Payne Sept. 8 in front of a packed Wisdom Gym. The TexAnns are looking to build as a team this year with new players and a new assistant coach, Ashlee Hilbun. Hilbun was hired after volleyball assistant coach Jessie Ramirez resigned over the summer after her first season with the TexAnns. Schindler said she is excited to have Hilbun on the team and says she will bring a lot of experience. Roberts and senior middle blocker Kenya Alexander received numerous honors after the historic season. In addition, Roberts and Alexander were also among the players chosen in the 2015 Lone Star Conference preseason polls as Offensive Player of the Year and Defensive Player of the year, respectively. Roberts said that she loves the pressure and uses the title as motivation. Schindler said the main things the team is working on this year are consistency, ball control, and terminating early. The TexAnns took first place in the 2014 Lone Star Conference Tournament, after defeating the top seed West Texas A&M in five sets in the semifinals. The TexAnns then went on to defeat San Angelo State University in five sets in the final round of the tournament, claiming the title of the Lone Star Conference Champions for the first time in Tarleton history, receiving an automatic bid to the South Central regional tournament as the No. 6 seed. The TexAnns started off hot in the South Central regional tournament, sweeping No. 3 seed Metro State in the first round. 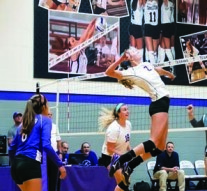 It wasn’t until the match between the TexAnns and the Lions of University of Arkansas-Fort Smith that brought Tarleton’s historic season to an end. Despite the 4-1 loss, the TexAnns still made history after making their first ever NCAA tournament appearance and claiming their first win in an NCAA regional game.